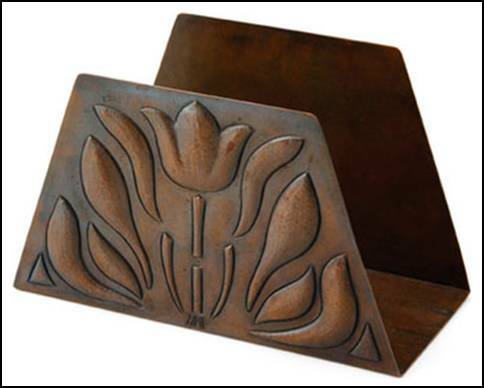 Letter holder, copper, early, truncated pyramid shape, with large repousse stylized tulip, leaf, and stem design on front, small engraved HHF (or HHE with stem on E) mono at very bottom, which is possibly an early and very unusual maker's signature. Excellent dark original patina. 5-1/2" W and 3-3/8" H and 2-5/8" D. Signed HAND BEATEN / AT / KALO SHOPS / PARK RIDGE / ILLS.